All Intalage teachers are paid on the same salary scale as an American teacher. Salary is based on experience and location. As an Intalage teacher, your salary is based on the district or state salary schedule for that academic year. If the district and/or state budget changes, your salary will be adjusted to the revised schedule. Your salary is subject to Federal and State income taxes as well as Federal Insurance Contributions Act deductions. Please keep in mind that your home country may or may not have a tax agreement with the United States. 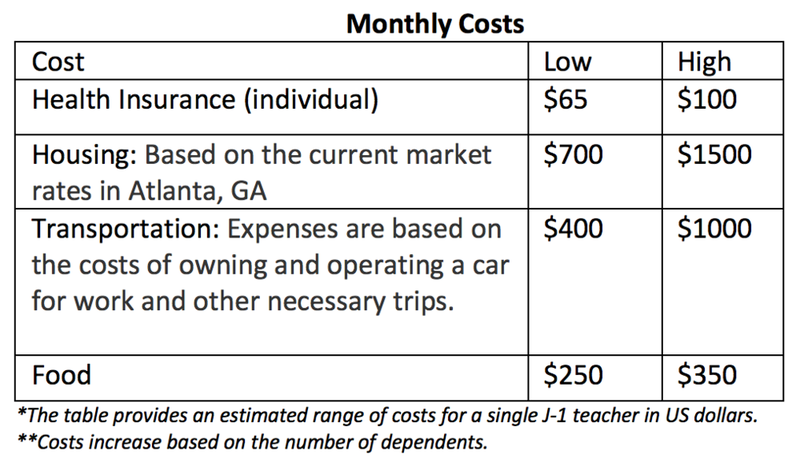 The table below details a summary of the costs that Intalage educators may incur. These expenses may vary depending on your home country as well as the city and state you will work in during your tenure here. Of note, Intalage works with third-party affiliates throughout the world to assist in finding, shortlisting, vetting, and interviewing applicants. Teachers will incur a fee in their home country by Intalage affiliates.